Dr. Konstantin Bozhinov, PhD, performs on the lute, guitar, accordion, piano, and organ. A specialist in improvisation and composition, he lives in Vancouver, Canada and enjoys a busy schedule as a performer, choir director, researcher, and educator. He is Director of Music, Choirmaster, and organist at St. Christopher's Anglican Church in West Vancouver. 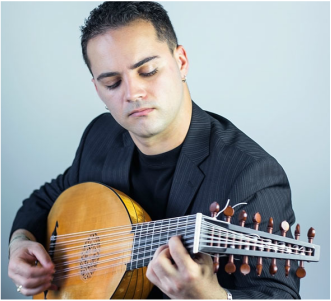 Konstantin holds a Performance Diploma in Classical guitar from Douglas College and a Bachelor of Music in guitar and lute performance from the University of British Columbia, studying with Michael Strutt and Ray Nurse. Graduate studies include a Master of Music in performance from McGill University, studying basso continuo and lute with Sylvain Bergeron. Holding a PhD in musicology from the University of Victoria, Konstantin is a researcher of performance practice, the psychology of music, and the philosophy of aesthetics. Current chief editor for the academic journal Musicological Explorations, Konstantin is also music critic for the Coastal Spectator, the Lute Society of America Quarterly, and contributor to Classical Voice North America. Performance highlights include appearances with the Vancouver Symphony Orchestra, the Victoria Symphony Orchestra, the Edmonton Symphony Orchestra, Pacific Opera Victoria, the Vancouver Bach choir, the Pacific Baroque Orchestra, the Kensington Sinfonia, and the Sidney Classical Orchestra. He was a featured performer at the Boston Early Music Festival and Vancouver's annual Dîner en Blanc. Kosta has recorded soundtracks for movies and best-selling video games on the guitar, lute, accordion, and organ.